The SMC Mixers, Meralco Bolts, ROS Elasto-Painters, and Alaska Aces were the big winners of this week, while the Petron Blaze Boosters and the GlobalPort Batang Pier hit different snags in the battle for playoff position in the current PBA Commish Cup. This past Wednesday, Chris Ross came up big when it counted the most. The former second-fiddle playmaker got some big stops down the stretch and hit the marginal free throws as Meralco completed yet another narrow escape, beating Air21, 89-88. Import Eric Dawson also showed up, tossing in 35 points, grabbing 17 rebounds, and netting 3 steals for the Bolts, who are now at fourth place with a 3-3 slate. The Express wasted their scintillating fourth quarter rally, not to mention Michael Dunigan's 40-point explosion, by dropping the ball in the endgame. Dunigan's errant pass led to Ross's free throws, while Mike Cortez's final turnover sealed the ignominious fate for Air21. 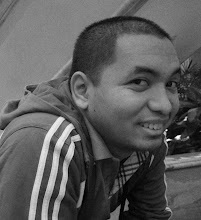 We also saw how Sunday Salvacion produced another splendid shooting game. Sunday what are you eating? The virtually forgotten sniper had his second straight impressive game, scoring 18 points -- all on three-pointers -- to backstop Dawson's heroics. He hit 6 of his 9 attempts from rainbow country, which means he leads the league with 6 treys per game and he's currently shooting at an unbelievable EIGHTY-SIX PERCENT clip. Are you serious, Sunday? Again, what in tarnation are you eating?! Right after that match-up, the San Mig Coffee Mixers won over the Alaska Aces, 75-68. Five guys in double-figures for coach Tim Cone and the Mixers -- Denzel Bowles with 16, James Yap with 11, and 10 each for Mark Barroca, Joe Devance and PJ Simon. For the third game running, the Mixers have shown the kind of offensive balance that made them such an indomitable force in last season's Commish Cup. The result? They're now tied with Meralco and Barako at fourth spot with 3 wins and 3 losses each. Denzel Bowles continues to bowl over the competition. 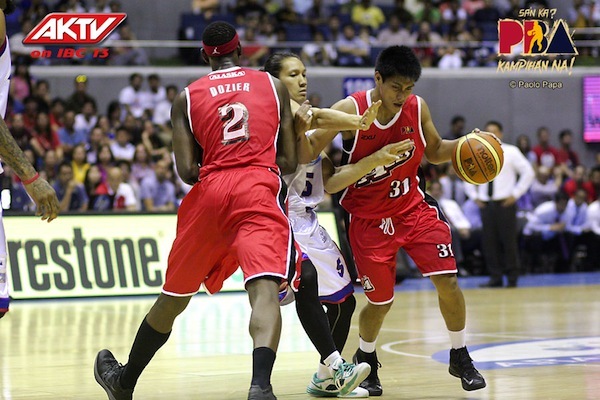 Alaska's vaunted pair of wingmen, Cyrus Baguio and Calvin Abueva, sputtered in this match-up. The usually dynamic duo combined for just 3-of-17 FG shooting to finish with 13 total points. Abueva actually missed ALL his field goals. They also turned the ball over a combined 6 times. To compound things even more, import Robert Dozier had maybe his worst game yet, shooting a miserable 7-of-18 from the floor. With this third straight win, can we say that the defending champs are really back? Let's see. Bowles seems to have settled into a groove. The aforementioned offensive balance is there. The defense has held up. Yep, I guess we can say this is the B-Meg of old again. Good news for coach Cone, but bad news for everyone else. As good was Wednesday was, however, Friday was smacking! 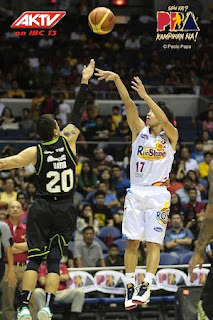 First off, Chris Tiu came through in the clutch as ROS beat GlobalPort, 103-95. The matinee idol made two triples in the waning minutes to snuff out GlobalPort's last ditch rally and preserve a hard-earned win. Tiu shot 3-of-7 from beyond the arc overall and ended with a 16-point total. Bruno Sundov and Jervy Cruz also contributed well, forming a strange frontline duo that registered 32 points, 20 rebounds, and 5 assists. In contrast, Batang Pier import Justin Williams probably knew he was on his way out, finishing with a paltry 6 points and 10 rebounds in 25 minutes. 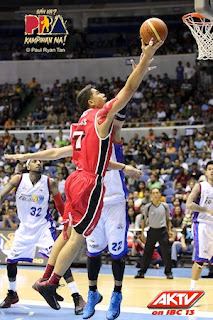 He did block 4 shots, though… the last 4 blocks of his brief PBA career. This just typifies how the Batang Pier continue slipping in the standings. 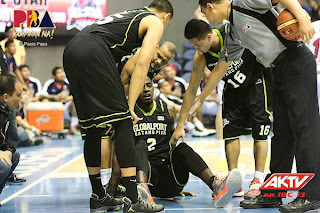 GlobalPort, after a strong start to the conference, is now at 2-5, with only the Gin Kings and the Express below them. The Batang Pier just fired Williams and have now hired former Seattle Supersonics draft pick Walter Sharpe. Also, team manager BJ Manalo hinted that more changes are to come. Perhaps the most memorable moment in the game, though, was Balkman’s choke job in the fourth. He may have taken his comparisons to Kenneth "Manimal" Faried a little loo literally. As a fruit of his game-long frustration, the former NBAer practically got all up on everyone's grill. 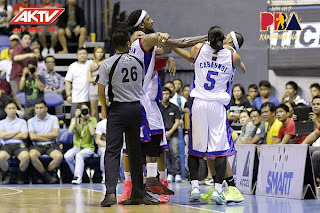 In particular, Balkman tussled with teammate Arwind Santos. Santos tried to pacify the Petron import only to be on the receiving end of a right-handed choke. So what did Arwind do? He tried to choke Balkman back, of course. With the twin wins of Alaska and ROS, can we christen them the new PBA Royalty? Judging by the way both teams have been playing, it might not be a stretch to label both the Aces and Elasto-Painters as the new teams to fear in the PBA. The big question is, can they remain consistent? And can they win when it counts the most? Chris Ross showed his worth as leader of the Meralco Bolts. Ross atoned from his early miscues with crucial stops and two pressure-packed charities to propel the Bolts to a tense 89-88 win over the Air 21 Express in the PBA Commissioner’s Cup on Wednesday night at the SMART-Araneta Coliseum. For awhile, Ross appeared to play as goat for the Bolts. He had a crucial turnover and an offensive foul committed against Mike Cortez, just when the Express had already grabbed the upper hand after a long chase. But he found a way to redeem himself. 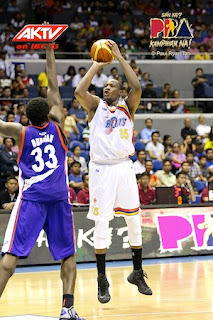 He intercepted a bad pass from Air 21 import Michael Dunigan. He was fouled in the process by Mark Isip and calmly sank both charities with 11 seconds left. Ross completed his heroic act in the Express’ final play, stealing the ball from Cortez then ran the remaining time out to preserve the win for the Bolts. The Bolts have won their second straight game and improved their standings to 3-3, tied for fourth place with Barako Bull. Eric Dawson led the way for the Bolts with 35 points, 17 rebounds and three steals while Sunday Salvacion played his second consecutive solid game, adding 18 points on a prolific 6-of-9 shooting from beyond the arc. The Bolts squandered a 15-point, third quarter lead, 69-54, and allowed the Express to mount a big rally. A 15-2 run in the fourth period behind Dunigan’s berserk, gave the Express an 88-85 lead, but they committed two crucial turnovers down the stretch, allowing the Bolts to score the last four points of the game. For coach Ryan Gregorio, the experience of losing big leads, but winning in the end, will eventually help his squad to toughen up. MER 89 – Dawson 35, Salvacion 18, Cardona 11, Hugnatan 8, Ross 6, Hodge 4, Buenafe 3, Manuel 2, Reyes 2, Artadi 0. AIR 88 – Dunigan 40, Isip 13, Canaleta 7, Custodio 6, Omolon 6, Ritualo 5, Cortez 4, Arboleda 3, Sena 2, Menor 2, Atkins 0, Wilson 0, Baclao 0. Chris Ross was a revelation against the Express. 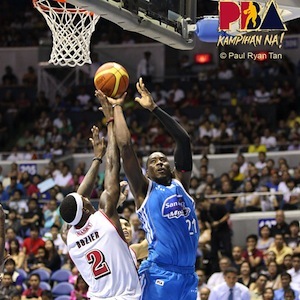 Two breathtaking plays down the stretch were enough to signify that Monster Bowles is indeed back in the PBA. Denzel Bowles came through with his signature dunk then capped the night with a big block against his counterpart Robert Dozier typifying San Mig Coffee’s dominance over Alaska on Wednesday night’s PBA Commissioner’s Cup game at the SMART-Araneta Coliseum. Bowles had 16 points, 11 rebounds, five assists and four blocks in the Mixers’ 75-68 victory. 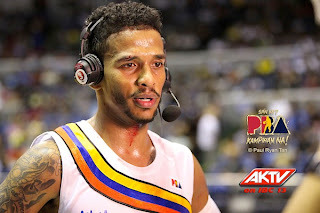 But the reigning Best Import didn’t get the job done on his own. The defending champions played true to form in handing the Aces’ first taste of defeat in the tournament. Four other players contributed double figures for the Mixers. James Yap had 11 points on top of six rebounds while Mark Barroca, Joe Devance and Peter June Simon each tallied 10 points in a display of balances firepower for the Mixers. In winning for the third straight game, the Mixers were able to reach the .500 mark for the first time in the tournament, a position which will put them back in solid contention. “I tell the team, we’ve got to get to .500 and try to work from there. It was a horrible first three games for us. We’ve kind of developed a blueprint on how we want to play now,” said Cone. After holding Talk ‘N Text to just five points in a quarter in a one-sided win last time out, Alaska was given a dose of its medicine in defense by San Mig Coffee. But for Cone, it’s also a case of the Aces not making their usual shots. “They didn’t shoot the ball very well tonight. We spent the game trying to exploit mismatches, jumping on Denzel’s back and relying on our defense, it served us well,” added Cone. The Mixers squandered a 23-point lead in the fourth period. But when the Aces were trying to mount a rally, San Mig Coffee got the much needed alarm call from Bowles, who slammed a putback to give his team a 75-65 lead inside the final minute. On the return play, Bowles was playing second defense and swatted away a short stab by Dozier. Those two big plays from Bowles proved to be lasting impression for the Mixers, who forged a three-way tie for fourth to sixth spots with the Meralco Bolts and the Barako Bull Energy Colas. SMC 75 – Bowles 16, Yap 11, Barroca 10, Devance 10, Simon 10, Najorda 6, Pingris 6, De Ocampo 5, Reavis 1, Mallari 0, Gaco 0, Gonzales 0. 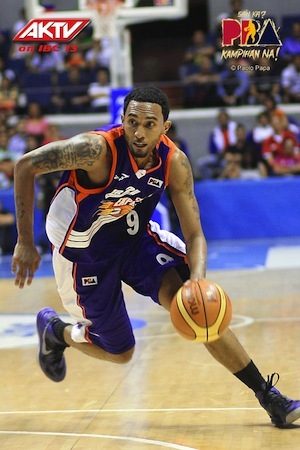 ALA 68 – Dozier 16, Thoss 13, Jazul 10, Espinas 8, Baguio 7, Abueva 6, Hontiveros 5, Casio 3, Ramos 0, Dela Cruz 0. QS: 12-18, 40-28, 62-39, 75-68. PJ Simon continues to come up big for the Mixers. Chris Tiu played the best game of his PBA career to help Rain or Shine Elasto Painters continue their winning streak with 103-95 triumph over the GlobalPort Batang Pier Friday at the SMART-Araneta Coliseum. Tiu finished with 16 points and four assists, hitting two three-pointers in the last three minutes of the game when GlobalPort was making a big rally. “Chris Tiu hit some big shots. We’re thankful they came at the right time,” said Rain or Shine coach Yeng Guiao. Tiu’s last three-pointer gave the Elasto Painters a 96-92 lead with 1:03 left in the game. After the Elasto Painters made a stop at the other end, Jervy Cruz buried a jumper from left wing to push the lead to six points and take the fight out of the Batang Pier, who lost their fourth straight game to see their win-loss record drop to 2-5. By notching their fifth straight win, the Elasto Painters’ record improved to 5-1. “We really got a scare in the second half. We kind of relaxed. We’re lucky that their import really didn’t make much contribution but the locals played well,” added Guiao, who noted GlobalPort’s defensive adjustment after halftime. The Elasto Painters built a 17-point lead at the half, and were still up 73-58 in the third quarter after a slam from import Bruno Sundov. But the Batang Pier scored the next 14 points capped by a Willie Miller three-pointer to threaten, 73-72. GlobalPort grabbed the upper hand, 89-88, after a three-pointer by Gary David, but the Elasto Painters were able to get their collective act together in the endgame to pull off the win. “We had defensive lapses. The reason why we got the lead was because we played good defense in the first and second quarters, but we relaxed in the second half. Good thing that we made some big shots against their zone,” said Guiao. Six GlobalPort players finished in double figures led by David’s 23 points. Justin Williams, who played his last game for the Batang Pier, finished with only six points, but added 10 rebounds, and four blocks. He played for 25 minutes, but was not fielded back in for majority of the second half. ROS 103 — Sundov 17, Tiu 16, Cruz 15, Norwood 13, Ibanes 9, Quinahan 7, Matias 6, Tang 6, Rodriguez 6, Lee 5, Belga 3, Arana 0. GLO 95 — David 23, Mercado 18, Miller 13, Salvador 11, Aguilar 10, Antonio 10, Williams 6, Yee 2, Lingganay 2, Belencion 0, Crisano 0. QS: 23-17; 52-35; 73-69; 103-95. Sel Guevarra interviews a still-injured Jeff Chan. down the stretch for ROS. The Alaska Aces are back on top of the heap. Coming off their first loss of the Commissioner’s Cup, the Aces responded with a 83-73 victory over the Petron Blaze Boosters to take back the top spot in the standings Friday at the SMART-Araneta Coliseum. 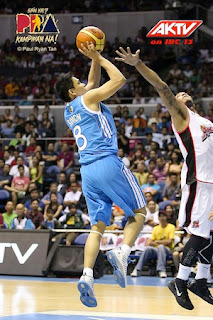 It was a nip-and-tuck affair all game, with the Boosters still up, 70-69, on a basket by the returning Alex Cabagnot. But a three-pointer by Dondon Hontiveros touched off a 14-3 run that broke the dam open for the Aces, who won their sixth game in seven outings. The loss snapped Petron’s five-game losing streak. A bizarre sequence occurred late in the game, after Petron import Renaldo Balkman got into a shoving match with teammate Arwind Santos. The scene ended with Balkman grabbing Santos by the neck and having to be restrained by coaches and teammates. Sonny Thoss posted 14 points on 7-of-9 shooting to lead Alaska. 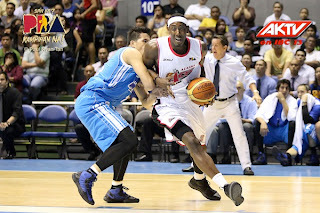 Yes, Renaldo Balkman is dangerous -- even to his own team!